Following are a small set of reference books for studying the coins of British India. The Krause books are standard reference guides with suggested pricing. They provide a good checklist for coins. Most of the others are more detailed in their study of the coins and their many varieties. This excellent reference book is readily available and is a valuable guide for the world coin collector. It has an excellent British India section, though without the kind of detail available in the following books. The collector of all monarchs will certainly want the standard edition covering the 20th century as well. Unfortunately for Victoria collectors, this volume does not currently list the 1901 issues. A detailed listing is provided for all the coins, along with useful pricing guidelines for four grades. No British India collector should be without this useful reference. This excellent reference book is available in a third edition which has a few changes in the India section. Like the previous edition, this volume does not list the 1901 issues of Victoria. I finally decided to add this new edition to my book shelf, partly to be sure I wasn't missing something at the web site. 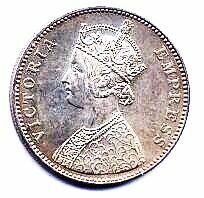 There are only a few new coins listed for Victoria, so you may find the older edition (along with the checklists on this web site) sufficient. Like the 1801-1900 edition, this volume is an essential resource for the collector of British India. I added this book to my shelf when I decided to expand to the monarchs following Queen Victoria. There seems to be a blank space where the George VI Rupee KM-551 should appear, but it is just as useful as the above Krause catalogs. It's too bad you can get a small volume containing the listings for all of British India 1801-present. Dr. K. N. Sharif, a numismatist from Bangalore, India, has provided an excellent resource for the British India collector in this volume covering the years 1862 through 1956. The book contains many line drawings and a few photographs to illustrate the many varieties. I ordered this book directly from India in the 1970's but a quick search on the Internet revealed it was still available. If you can find a copy you won't be sorry if you purchase it. Dr. Sharif claims to have examined literally thousands of coins to compile the information contained in this volume. One novelty I found in my first edition was the use of hand-drawn lines around some of the tables. This is an incredibly detailed and painstakenly-researched work on the coins of India, including proofs and trial strikes. No serious collector of British India should be without this book. It is still available on the used book market, though it won't be cheap. Still, I strongly recommend your investment in this excellent and inspirational work. Regency Coin and Stamp Co. Ltd. This is useful reference book containing detailed listings along with photographs and line drawings of features of the coins. 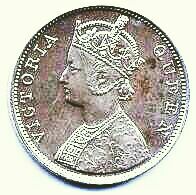 It also covers many other countries of the British Empire, which may make it attractive to many collectors. There are catalog values for the coins in six grades, though (of course) they are rather dated now. There are many illustrations and notes on the features of the coins of India, so this is an excellent addition to the library of a collector of British India coins. I can't speak with any authority on this book I only recently received, but it appears to have a lot of interesting details and may provide material unavailable elsewhere. One very interesting addition is the effort to update the book through Addenda. I have four of these dated 1979-83, 1984-87, 1988-91 and 1991-95. If you purchase this book be sure to ask about these supplements. This was probably my first book on world coins and is an excellent catalog for the world type collector. I still label my coins using the "Y" numbers, as you can see on the checklist pages. The listings show only the major coin types with date spans listed for each coin type. At the Amazon web site Scott Semans said this in his review of the 1984 edition of this book (which covers 1850-1964): "Simply put, this is THE classic handbook for world coins for a generation of collectors; first edition, 1964. ... Yeoman is still worth having because it is compact, because it lists coins in historical rather than denominational order, and because of its numbering system - still in use and the most sensible ever developed for world coinages." Copyright 1971 by Krause Publications, Inc. This interesting little pamphlet (36 pages, including cover) is restricted to the Rupees dated 1862. As it says, "The material presented in this monograph was originally presented in two installments in the August and September, 1970, issues of Coins Magazine. It has been completely revised and updated to incorporate the latest available details relating to the Indian rupee series of 1862." Though naturally dated, this publication contains some very useful material, including many photographs (though reproduction isn't of high qualify, the photos are large enough to reveal some details). Some of the photographs illustrate details I haven't seen mentioned elsewhere. There is a discussion of the count of ridges along the edge of the coin, something I've never seen elsewhere. I believe this pamphlet will prove to be most useful and will suggest valuable areas of research.